1538, when Anglican parish registers were really first kept, is a watershed date for all genealogists. After that, however murky it might seem at times, there was at least a system in place to record births, marriages and deaths that can hopefully be traced. But going back before that date is rather like venturing into a dark old forest with no paths, unsure if you can find your way through. Not many genealogists have managed to break the 1538 barrier. The single biggest problem is the lack of written records. Many just haven't survived, of course. But even if most of them had, the majority of the population wouldn't have been named in them; they weren't deemed important enough. For the rich, of course, it was different - position and inheritance relied in part on written records. Criminals, too, would have their names recorded. The poor but honest - in other words, most people - would remain anonymous. Where you can locate documents, they can be difficult to both translate and interpret. Depending on the period, they could be in Middle English, Latin or French, and the social customs and terminology were vastly different at times to what we understand today. Dates, for example, were usually expressed through the regnal calendar (based on the reign of the monarch). In other words, simply understanding what's in front of you requires additional research and learning. There's very little guidance on how to investigate the period. However, there's one consolation - most of the records are held at the National Archives, and they do have a pamphlet that offers some tips to help you. Most people, though, are happy if they can simply go as far back as Elizabethan times. You might imagine the idea of surnames or family names has always been around. After all, it's a good way to distinguish one family from another. But that's not the case. If you go back to the 1300s and early 1400s, inherited surnames simply didn't exist. That's going to make your job almost impossible - establishing links when there's no common surname is a complex task, and depends on the assembly of other evidence to make it provable, evidence that, for the most part, doesn't exist. You're actually going to have the most success where a surname is based on a place name, the rarer the better. Those based on nicknames, occupations, or even topographical features (Hill) are going to find much harder going. Those based on place names, or locatives as they're known, stand a greater (but still limited) chance of success. The rarity of a locative can be measured, but it refers to the number of places bearing the name, rather than the amount of people. The more geographically limited the distribution of a name also helps your chances. 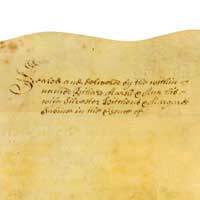 To 1538 you'll have dug back largely by using records of birth, baptism, marriage and death. As you go past that, the way you work will have to change. Instead you need to assemble as much data as possible, from many different sources, to establish relationships. Tax payments, jury appearances, court witnesses and other forms will be your sources. And even when you have those, putting them into a framework where you can properly assemble relationships takes time and effort. The simple fact is that, in the end, it might not produce results. Heraldry is an ancient profession, and the College of Arms has records that date back centuries. But it should be noted that coats of arms have their limitations in value to a genealogist, as they could miss out part of a pedigree, and the further back you go, the more magnified the flaws become. The problems with what are called visitation pedigrees (which rely on information supplied by the gentry themselves when visited by representatives of the College, which happened every 30 years or so from the 16th century) means they really shouldn't be the central core of a family tree unless there's no other evidence available. Local historians, frequently enthusiastic amateurs, can be a great aid to genealogists. In Victorian times, particularly, there was a burst of enthusiasm for local history (although you can find it much earlier - Ralph Thoresby in Leeds, for instance, published a definitive local history in 1715), and access to older sources not always available today. Many were happy to name individuals, and their work was often painstaking. The Victoria County History series is particularly valuable in this regard.